On our way out of Bellevue and towards home, we had to stop for breakfast because the last thing we wanted was 2 hungry, complaining kids for 2 hours. 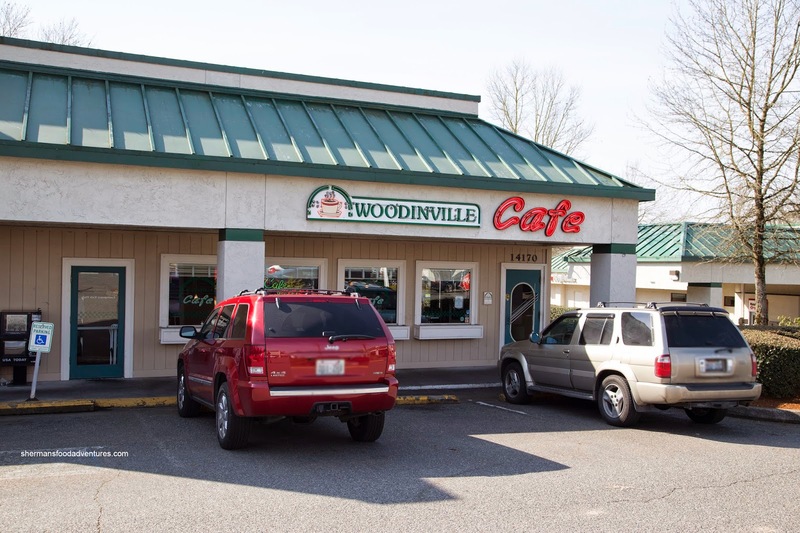 We ended up exiting in Woodinville and dining at the aptly named Woodinville Cafe. With a homey train-themed decor, the place was welcoming, including the friendly staff. We settled in and ordered quickly. However, that didn't stop our kids from whining about being hungry. I wonder how hungry they'll be when they get into High School??? Anyways, we'll get right into what they ate because it helped shut them up. My son went for the Kid's Breakfast with one strip of bacon, eggs and 2 mini-pancakes. 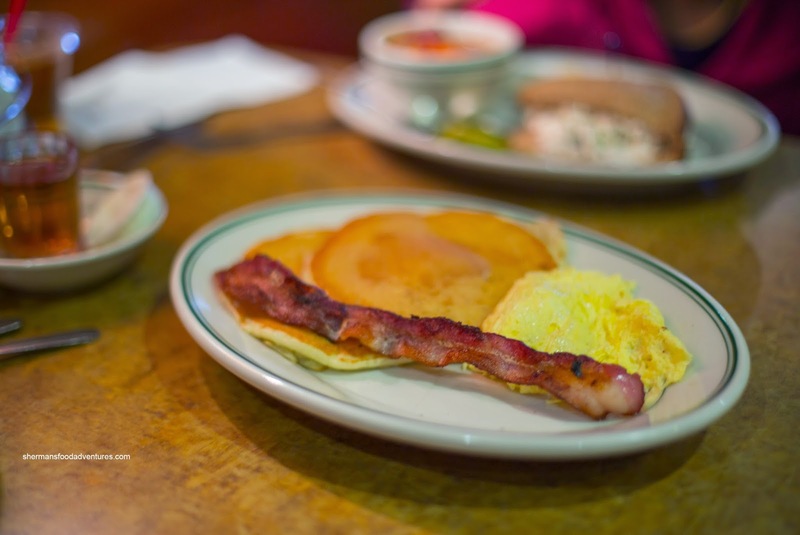 He dusted this off quickly not only because he was famished, but due to the nicely crisp bacon, fluffy pancakes and equally fluffy scrambled eggs. 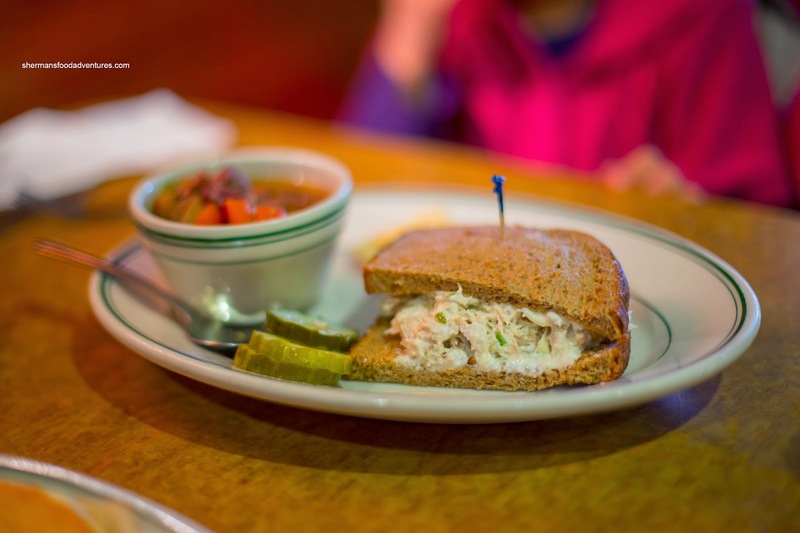 Inexplicably, my daughter chose to have the Tuna Fish Sandwich with a side of Corned Beef & Cabbage Soup (at 9:30am). Well, the sandwich was loaded with tuna, a touch too much mayo and celery. She liked the soup more as it was a meal in itself packed with tender chunks of beef. 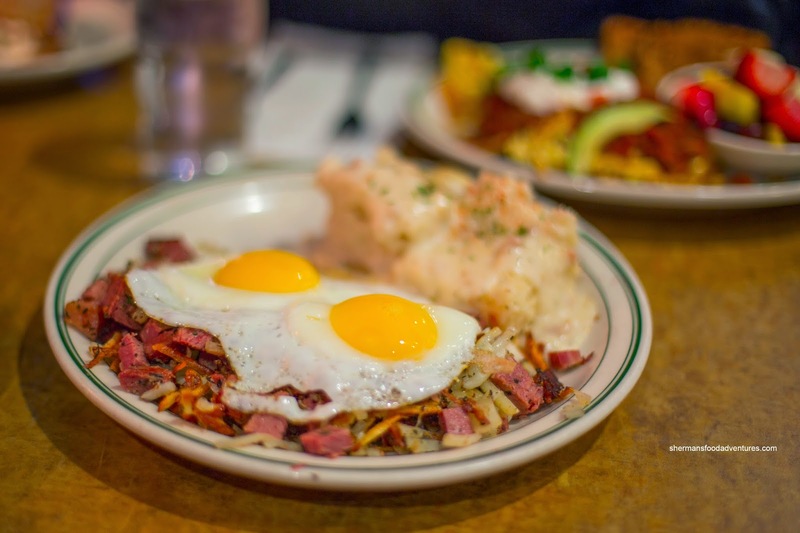 For myself, I had the Corned Beef Hash with a side of biscuits and country gravy. Viv cringed at my choice of side because country gravy and my stomach go together like a volcano science experiment. As for the hash, I liked the buttery cubes of corned beef as well as the perfectly sunny-side eggs. However, I wasn't a huge fan of the potato slivers that were dry and hard. 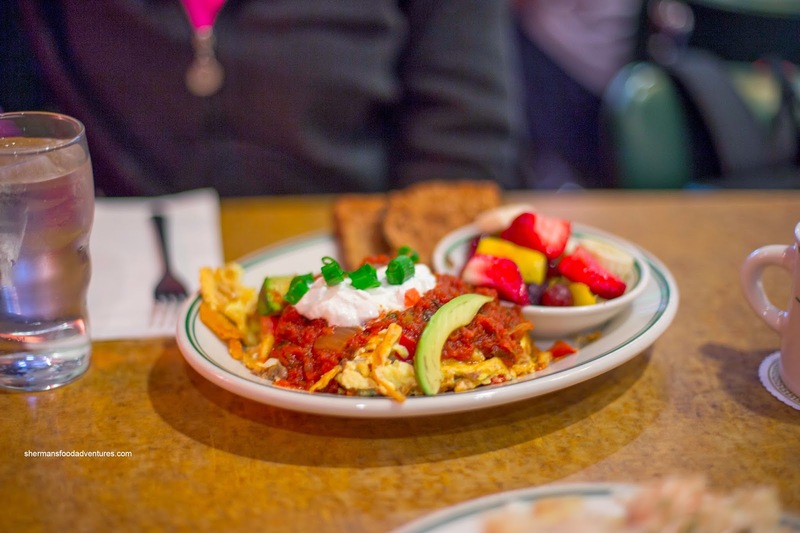 Viv ended up with the Migas consisting of eggs scrambled with seasoned taco meat, Tillamook cheddar, red & green peppers, onions and crispy tortilla strips topped with rancheros sauce, avocado, sour cream and green onions This was a pleasant, if not unexciting dish. With the promise of flavours from its menu description, the result was just a bunch of tomatoey eggs and veggies. Overall, Woodinville Cafe did the job. Not sure if we're dying to return, but definitely an option for breaky.